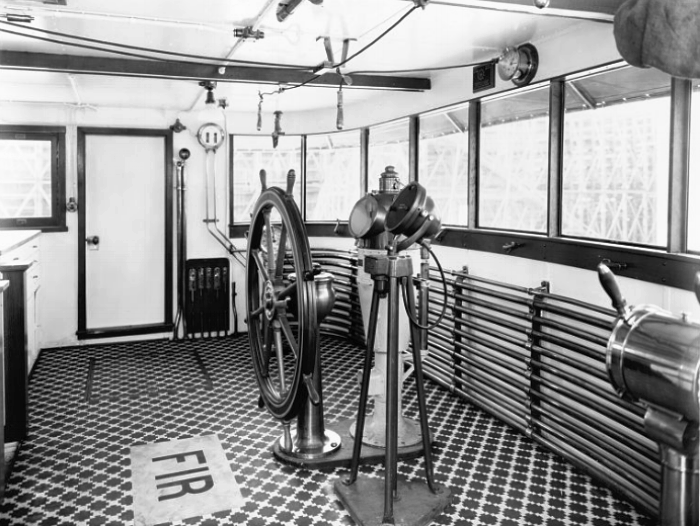 An early photograph of Fir's Wheelhouse above. The wheel now on display in a Maryland museum. The tripod device is a dead reckoning compass that would be mounted with binoculars. The mechanism just before the wheel in the bulkhead is a rudder indicator, and the engine telegraph is to the right. Pipes along the forward wall carry hot water for the heating/defrost system. The most striking characteristic of the existing wheelhouse is how few instruments are present. There is a center mounted wheel with binnacle and overhead rudder indicator. Several feet to starboard is the brass engine telegraph. To the rear of the wheel is a chart table with controls for the navigational lights. On each wall is a horn button, switches to set off alarms, and several telephones. The telephones are voice activated (requiring no electricity to operate). On the ceiling are controls for the wipers, search lights, and fog horn. While we want to maintain Fir's integrity and classic looks, at the same time we must reduce her crew requirements. This is made possible by greatly increasing the level of automation in the Wheelhouse. A captain should control the main systems, and maintain situational awareness without requiring a dozen lookouts. Our plan is to refurbish, and update existing equipment with current technology. To accomplish this we will build two new consoles, one on each side of the Wheelhouse. One console will manage the running of the ship while the other will focus on maneuvering in constricted areas. The center of the Wheelhouse will be preserved, with the wheel and binnacle remaining in position. The engine telegraph will be moved a few feet to center. This will allow one helmsman to operate the engine with the original controls. We will build a new bulkhead forward of the existing wheel, replacing the existing rudder angle indicator. The new display will have information available from our N2K network including heading, depth, speed, and wind conditions. See instruments for further information. The new console to port will be designed to operate the boat while cruising. This will include large format chartplotters, radar, sonar, AIS, cameras, VHF radios, electrical system monitors, weather systems, autopilot, rudder controls, generators/inverters, monitoring systems, the Ship's Computer and lighting. Immediately behind this console lies the existing chart table. We will keep the original chart table using some drawers for printed charts. We plan to flush mount a touch control screen for our Navigational Computer, and repurpose the top drawer for a keyboard and mouse. Our long distance communication devices will be housed in the back of the chart table. In the end, the port side of the Wheelhouse will be dedicated to operating the boat while underway and developing routes. The console to starboard will be designed to control the boat while anchoring, docking, and launching tenders. This will include a single chartplotter, backup VHF radio, cameras, engine controls, controls for the windlass, and controls for the boom. The idea is to centralize all the controls and information required to anchor in a single space. This console houses controls for the boom. Prior to our beginning work, the boom was controlled from a "phone booth" type enclosed structure mounted on top of the Wheelhouse (discussion here). The phone booth was not original, ugly, and ineffectual. Our decision was to move the boom controls to the Wheelhouse. We are doing this in two phases. Phase one is simply to move the existing controls to the starboard console. This location offers a couple of operational advantages. Firstly, the operators position is lower and offset from center which gives the operator greater visibility of the hooks. Secondly, the windows in the Wheelhouse can be opened which allows the operator to verbally communicate with the crew on the deck. This console houses controls for the boom. Prior to our beginning work, the boom was controlled from a "phone booth" type enclosed structure mounted on top of the Wheelhouse (discussion here). For operational advantages we will move the boom controls to the Wheelhouse in two phases. First by simply moving the existing controls to the starboard console. This will give the operator greater visibility of the hooks due to a lower position offset from the center. In addition, the operator will now be able to verbally communicate with the crew on deck since the Wheelhouse windows can be opened. The second phase of our boom project will be to replace the existing controls with a joystick. Currently the controls require an operator manage the vang when moving the boom side to side. There is not a single control to move left or right. Instead, a motor pulls the boom to the right, while a separate motor pulls the boom left. Therefore, moving the boom to one side or the other requires an operator to run the motor in one direction while moving the other motor in the opposite direction. This is particularly difficult in the case of Fir as one motor is faster than the other. New technology is able to monitor the vang to adjust speed accordingly. Since the boom will not be used with any regularity, specifically trained personnel will not be a requirement. Ultimately, we need a system that is predominately automated. The area behind the close quarters console was once used for a desk, alarm monitors, and the older radar. We decided to remove the desk and replace it with a seating for guests who would like to spend time in the Wheelhouse. In addition to preserving parts of the existing alarm system, we decided to use this location to mount the direct current power supplies. There are two units, both made by Simplex. One produces 100 amps of 12 volt direct current, and the other 50 amps of 24 volt direct current. As we move forward, we intend to utilize the area under the settee to place an air handler for heat and cooling.